This Friday and ongoing all weekend is the 10th annual Sci-Fi on the Rock convention in the city of St. John’s found in my home province of Newfoundland, Canada. It also happens to be the first year where yours truly will be doing an hour-long panel about comic book games. One of the special guests this year is famous voice actor Kirby Morrow, who played an important role in my formative teenage years by voicing characters in Dragonball Z, Escaflowne, Mobile Suit Gundam Wing and most importantly, Cyclops in X-Men: Evolution. Morrow also voiced the Human Torch in the game I’m going to talk about today, Marvel Nemesis: Rise of the Imperfects. I would like to apologize to Mr. Morrow in advance, as this is going to be rough. In 2005 the once thriving super hero fighting game was on the decline. There would be no new Marvel Vs. Capcom game for over half a decade and we were even a few years out from the cheap rerelease of Marvel Vs. Capcom 2. 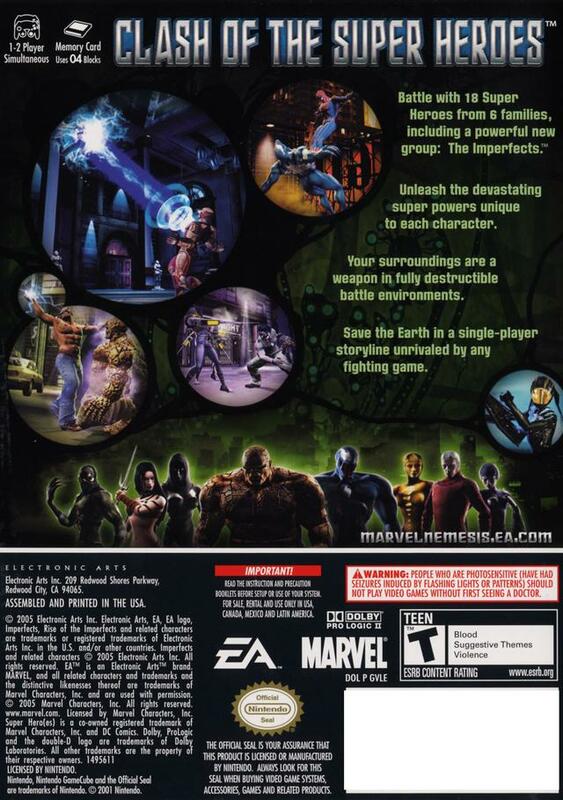 Keeping the torch alive was Activision with X-Men: Next Dimension in 2002 and EA who tried to not only make their first (and only) Marvel game, but introduce a new set of company created super heroes called the Imperfects. 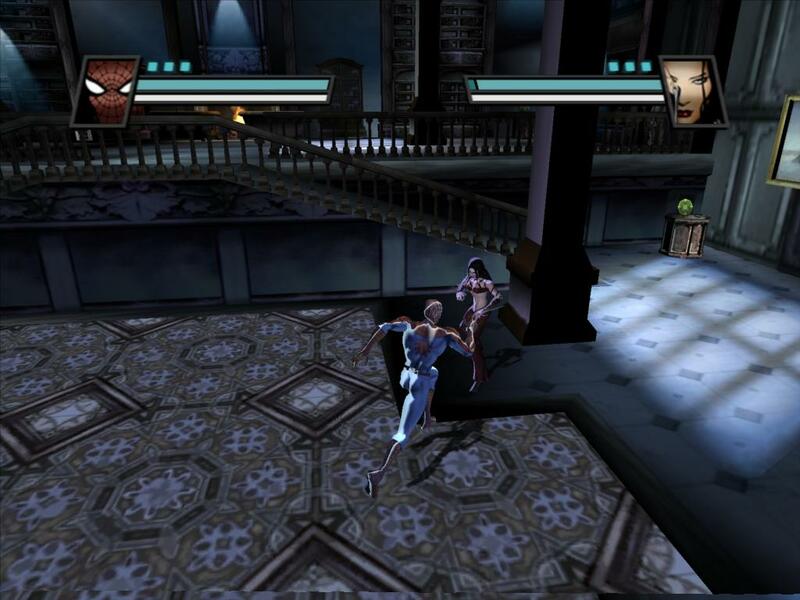 The final result was Marvel Nemesis: Rise of the Imperfects, a game that’s at odds with itself over what it wants to be and lacks even the most basic features found in most fighting games, that is when it says it is a fighting game. With so many better games to choose from, even at a time when this game was new, there’s absolutely no reason to entertain one of the worst Marvel, nay super hero, games ever. I always provide full disclosure when I don’t finish a game, as normally I try to because you never know when a bad game will suddenly become good or vice versa. I didn’t finish the story mode in this game as in my brief time spent with Marvel Nemesis, I didn’t see anyway in which it could have turned itself around. 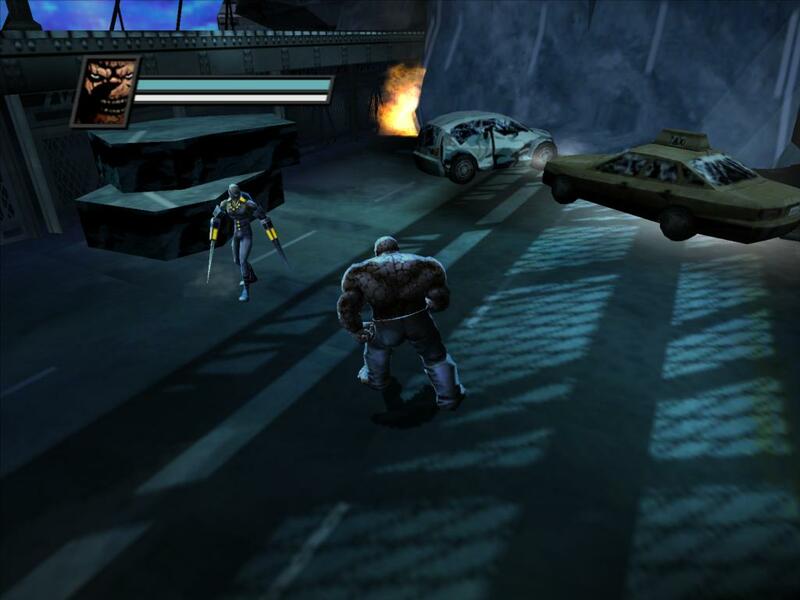 The story campaign which is laid out somewhat similar to Netherrealm’s fighting games, only one million times worse, deals with an alien invasion that is taking control of heroes from the Marvel Universe. This occurs at the same time when a mysterious group of characters known as the Imperfects appear on the scene. I wish I could have made it through the nonsensical story this game was trying to tell, because it was just downright stupid. It doesn’t boil down to one issue, but a culmination of a lot of a lot of them. The graphics are dark, muddy and ugly, with most of the arenas you’re fighting in being boring alleys and rooftops. Even when you fight a character in a place like the Avengers Mansion, you only know this because you’re told it is. The story is told through a combination of merely passable in-game cut-scenes and an awkward live-action/CG mash-up in the case of the Imperfects origin stories. Mind you these introductions are done after the Imperfects show up in the game’s story mode, when it should have been the other way around. That being said, it was smart to put some Marvel characters first because really, who cares about a bunch of nobodies called the Imperfects? Crossovers are a good way to introduce something when done right because you have the opportunity to sneak something in that’s not as well-known alongside something that’s very popular to create more public awareness for an otherwise unknown but deserving property. For example, as popular as Black Widow is in the comic community, she wasn’t nearly as identifiable to a lot of people until she showed up alongside the likes of Iron Man and Captain America in Iron Man 2 or The Avengers. For this to work though, you have to crossover with something that’s at least known somewhat. I understand what EA was trying to do in launching new characters in a Marvel fighting game because it was already a proven concept with Marvel Vs. Capcom. EA also didn’t really have their own stable of franchises other than sports properties like Madden and racing games like Need for Speed so it was clever to try and spin one or possibly more game franchises out of this title. The thing about MvC, however, is that the fighters on both side of conflict had decades of popularity behind them, and the game was also fun. Marvel Nemesis’ problem is that we don’t care about the Imperfects and the game also isn’t very good. The reason why the Imperfects don’t work is because they look something that came straight from a kid in the 90’s notebook with stupid names like Johnny Ohm and The Wink. The females get the shortest end of the stick with most of them being half-naked in fetish gear. It’s not just the Imperfects who are poorly realized, but some of the characters from the Marvel side as well. People like Spider-Man and Captain America, who only shows up in the PSP game, have their classic looks while 2005 was the year of the white t-shirt and jeans for Wolverine. Elektra is on the back of the case for the game, and if not for her holding two sai’s, I wouldn’t even know it was her. Even when she shows up in the game wearing heels, a bra and pants that make sure her whale tail sticks out, I didn’t at first believe it was her. See the one with the sais? That’s Elektra. No, I’m not kidding. All of the terrible story telling, characters and graphics could at least be saved somewhat by a half-way decent game, and at times when it tries to be something other than what it says it is, Rise of the Imperfects is actually pretty good. The game has only two modes: story and versus. The story mode initially only allows you to pick between two characters: Wolverine and The Thing with more becoming available once you complete more chapters. The game is sold as an arena fighter like Power Stone or more recently Marvel Battlegrounds, but starting out the game plays like a very passable beat-em-up. Instead of fighting one opponent, you fight through waves of enemies with a pretty decent combat engine. You have an attack that can be modified by holding down the R-trigger to perform a super move as well as a dodge roll, throw and block. There’s even some light environmental traversal thrown in with characters like Wolverine and Elektra where you can perform Prince of Persia like wall runs and climb up walls. This all becomes less fun when the game starts becoming a fighting game. The second you’re thrown in a fight as Wolverine against one of the Imperfects, the game’s difficulty goes from casual to controller-throwing hard, and I played on easy. Your enemy will deal massive damage while you struggle to even deal a fraction, and your moves account to nothing when you can do equally as well by throwing pieces of the environment. Before you end up realizing this though, you’ll probably end up dying multiple times when the computer can finish you off early, even when you have a quarter of your life left. The mechanics that were suitable for a beat-em-up fall apart when the game actually becomes a fighter. They’re far too basic even for casual fighting game fans with no difference between any of the characters really other than some are more nimble or heavy than others. Unfortunately to see the rest of the roster, you absolutely have to play the story campaign which is insufferably bad and frustratingly not fun. So if you’re inclined to hear Kirby Morrow’s take on the Human Torch, be prepared to strap in for one of the worst fighting game story modes ever that’s not really worth the effort you put into it. You can play versus either alone or with a friend, but you only have a very limited roster of fighters with Spider-Man being the main stand out that you don’t see in the early campaign. When playing versus mode you can also only do two characters at once which is pretty criminal as this game is less Street Fighter and more Super Smash Bros. or again, Power Stone, the latter of which ran on inferior hardware to the GameCube. It could be that the amount of characters on-screen was kept down to two as on the PS2 and Xbox this game has online play, but there’s no reason why local play couldn’t manage up to four characters. 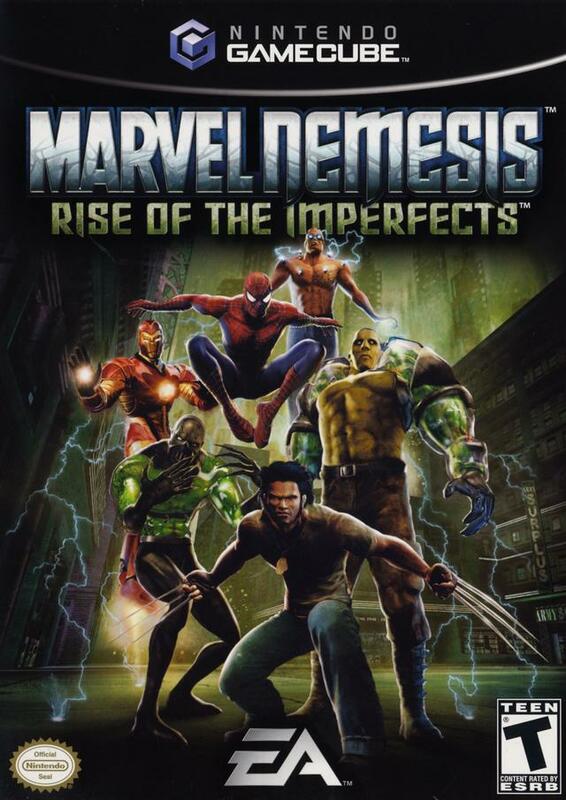 Marvel Nemesis: Rise of the Imperfects is a game that you probably forgot about, and for good reason: This game deserves to be forgotten. If the game was less a fighting game and more a beat-em-up, it would be maybe worth a look, but as it isn’t. There’s so many better Marvel fighters out there that you should be playing, like the recently released Marvel Battlegrounds. From the pointless new characters, dark, drab graphics and insulting character design, imperfect is a fitting word in the title of easily one of the worst games to feature Marvel characters ever.